John Boyd , Life Member of CTTA, died on February 22, 2019, after a serious illness. The Cheltenham TT Association was privileged to have such a talented man in the roles of Secretary (9 years), Vice Chairman (14 years) and President (16 years). 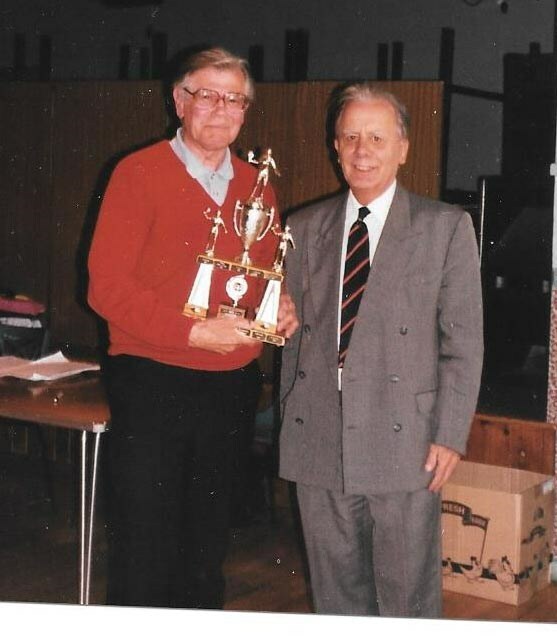 He was then made a Life member in recognition of his services, and was awarded the Ron Dawkins trophy for exceptional service to the Cheltenham Table Tennis Association. Older CTTA members will recall John , but few knew of his life outside table tennis. His loving younger sister gave the eulogy ,a comprehensive summary of his life at the funeral, and gave permission to quote these extracts, which illustrates his many talents and interests. John excelled at St. Pauls School in Hammersmith, and he finished his school career with ‘A’ Levels in Latin and Greek, French, and ‘O’ level in Spanish, which set the seal for his future career in languages. After school, he did National Service, during which he learnt Russian, and in 7 months passed A level Russian. He went on to Keble College, Oxford, where he thrived. He coxed the college boat crew, played table tennis, represented the college at chess and joined the Vagabonds Cricket club. From there he joined GCHQ, in Cheltenham where he worked until his retirement in 1995, having reached the position of Head of the Joint Technical Language Service in charge of 63 staff. He had the opportunity to travel widely with his work and was held in great affection by his staff. He was a Scout Leader, then Cub Scout Leader. He was awarded the Chief Scout’s Commendation for services to Scouting. He also chaired a panel investigating complaints against the NHS, which he found very fulfilling. He helped to organise the Cheltenham contribution to the National Japan 2001 festival, and had Japanese lessons for many years. In the last 10 years he travelled extensively, and had great pleasure in going to countries where his life would have been in danger previously when he worked for GCHQ. John had a massive stamp collection, started when he was a young boy with over 100 albums and incalculable stamps in envelopes, packets and tins. He also had cigarette cards, coins, geological samples and over 1000 books. Each of his journeys was remembered by an album of postcards and a collection of maps, guides, tickets and souvenirs. Mother Teresa quoted “The good you do today, people will forget tomorrow. Do good anyway.” That was what John did, and why he was an exceptionally good man.